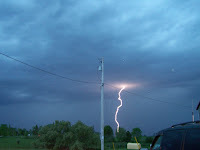 Life by the Creek: I caught some lightening!! In a picture. How else would I catch it? ;) Aren't these cool?? It wasn't raining yet at our house, but you could see it coming in south of us. I love how each picture gets darker and darker. Uhhhh, OK - you blonde or what?? So, yes, I love thunderstorms (especially when there's lots of lightening) but I prefer them without a bunch of rain.